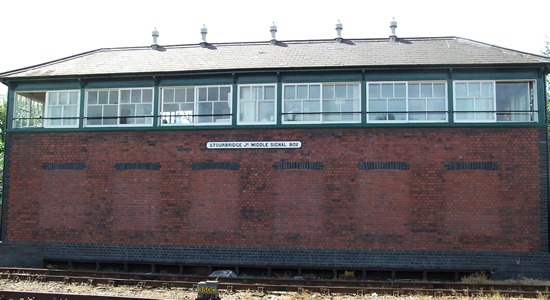 My Grandfather and uncle worked at Darlaston Goods Station for most of their working lives. If my memory serves me correctly, this station (or was it just a goods yard?) was located off Bentley Road South in Darlaston, on the line from Bescot to Willenhall. There is not a record of this station on this website. Not sure about the goods facility to which you refer however, there was an LNWR goods station off the Darlaston Loop near Wednesbury and can bee seen on the Wednesbury Town page as the buildings are still extant - although no longer rail-connected. Could that have been the site? I was talking to Ron Derry this morning, I told him about this site. Peter Melllings told me about it. Top site. Am enjoying exploring it. Does anyone know what line Brooke End signal box was on? Is it somewhere near Pensnett? Great to see pics of how things have changed. As a lad in Birmingham I have fond memories of Langley Green (complete with branch to A&W in Oldbury), and the original station at Stourbridge Town - including when a single car DMU ran through the buffers depositing a pile of bricks and its front bogie in the street below. Looking at position of former Newton road stn , the stn was nearer to Newton rd bridge .End of Water lane to jcn of the old Newton road.Behind the undergrowth and hedge there is a gap which i think was the pathway down to the stn.The pic is of Charlemont rd/ray hall lane crossing and there was a signal box there some years ago called NEWTON CROSSING. There were 3 versions of the station; two adjacent to Newton Road and the other where the photographs were taken on the Newton Road Station page which stood between 1863 - 1902 which I focused on as it is a more interesting site for photographs. Hi, just discovered your excellent site as I am new to home PC and the Web. Brings back memories as I worked the platforms at New Street 1989 to 2001. Enjoying looking at some of the familiar locations. Are you by chance the Andy Doherty who was a station manager at New Street? Thanks for a great site. Regards, Mal.